Graduated from Tokyo University of the Arts, Music Department, Vocal Course. Is active as a solo singer at recitals and joint concerts, etc. Has a wide repertoire in children’s songs, fondly remembered good old songs, madrigals and opera arias. Fassinated the audience with her unique, beautiful voice full of poetic sentiments. Is making efforts to try to offer her tuition to younger chorus group members through her volunteer activities such as singing in hospital concerts and nursing facilities for aged people. 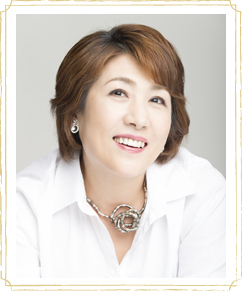 Is highly reputed as a chorus voice trainer, and helped more than one chorus groups to gain prizes; for example, in Takarazuka International Chamber Chorus Contest and Tokyo Vocal Ensemble contest. Went to Italy with the selected members to join 1995 Guido d’Arezzo International Poliphony Contest, in which was awarded 1st prize in mixed voice chorus section, and released a CD from Toshiba EMI 2nd Assembly of Practical Chorus Music in the title of ‘My Dear Madonna—Renaissance Madrigals’. Released from Nami Records Co.Ltd. a CD gathering solo songs by Yoshinao Nakada: ‘Sakana-to Orange（Fish and Orange）’ which is being well accepted. Through several short-term stays in Milano studied Itallian Classic songs and opera arias. Member of Nikikai Opera. Member of Nikikai Japanese songs study group.